It pays to be a craft hoarder. I have a ~scary~ craft closet full of all sorts of things. In a couple of bags I found moss, excelsior, spanish moss, feathers, nests...and more moss. I knew I would use them someday! We wanted this last wreath to be "springy." We pictured bugs, grass, nests, green. We used a larger grapevine wreath, I think it's 24-28". I wanted this one on my front door so it had to be able to hold up to four little boys constantly opening and slamming the door shut. First came the spanish moss, mixed with green moss. We wrapped thread again around the wreath to secure. Nicole had to head off to her wood shop and cut away for her Easter letter class...so I was on my own with this one. I think I called her twenty times to get her two cents, sending pictures by email. It helps to have a second set of eyes to tell you ...yeah..this doesn't look good...tweak this. My wreath looked...barren yesterday. So I added, fluffed, and stuffed with Nicole's advice. Looks much better now. I used floral wire to hold the nests on. The rest is hot glued. I guess if you want this to be more stable, you could use wire and picks. When I hot glued the eggs on, I nestled them down until I hit the grapevine, to give the egg something substantial to be glued on. 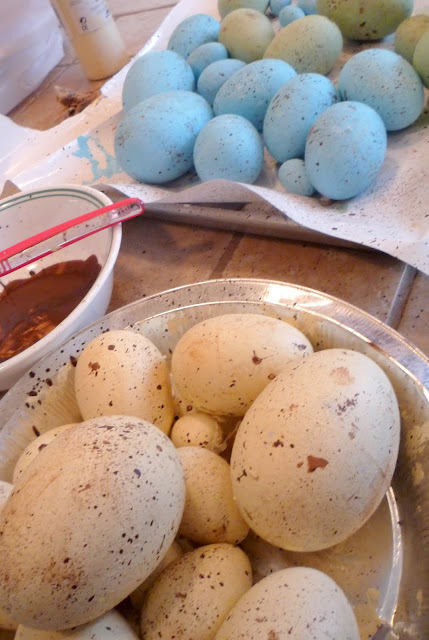 We spray painted and coated the ~plastic~ eggs with craft paint, and again...speckled with brown. 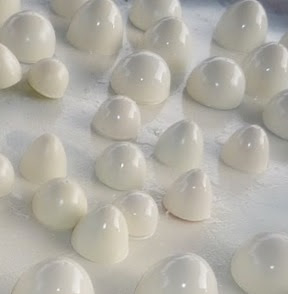 I did add- just a little bit- of E600 glue to each egg to keep them shut. for the wreath, so I spray painted them. I added sprigs of greenery, sticks, and a few flowers. I try not to get too jealous of your creative minds! I'm amazed at all the neat stuff you ladies come up with! Love this wreath too! this might be the cutest one yet! They all are so pretty! How are you spray painting them? I didn't think you could outdo the Ode to Cadbury wreath until I saw this one - now it's a toss-up. All 3 are darling - you're so creative! Very cute! I love the muted tones! Wow, it's so cute. And sophisticated. I had no idea plastic eggs could look so great! Wonderful job. Thanks for sharing on SNS! How adorable and even better, it looks like something I should be able to handle. Love the butterfly and dragonflies - they add the extra touch! this is the most gorgeous wreath all inspired by nature. i would pay to have this one! seriously! it is lovely. ok...i'm admitting this...new to your blog. haven't seen the other 2 wreaths...BUT i am on my way now. goodness gracious that's one beautiful wreath! um, where have i been? ok. now i am a hiige fan & follower. just had to come back & tell ya. that gun cabinet & doors...really! beautiful. love the cadbury wreath, but i think #3 is my fave. Okay... painting those easter eggs was so soooo clever!! I love how this turned out... and now that I think about it, I'm sure I have all the supplies hoarded away somewhere. I'm going to add this to my Faves post that I just posted last night. All three wreaths look great ladies! 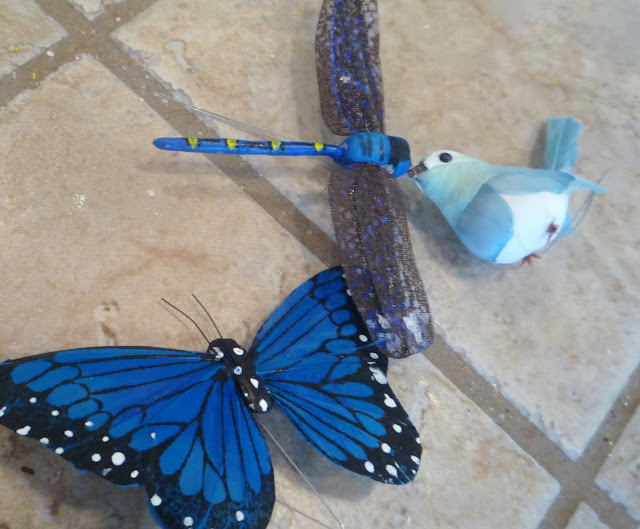 I thought about adding some bird and butterfly picks fromt eh dollar store to another wreath as well. Guess great minds think alike! Those wreaths are breathtaking. I have done the painted egg thing once, but I didn't come up with such great colors. Dag nabbit - I'm gonna paint those ugly eggs just like you did- I love these natural looking ones! The prettiest Easter Wreath I have ever seen. You amaze me with what you can do. Thanks for sharing. Going to try to paints some of them eggs tomorrow. Well done! The dragonflies are such a nice touch! these wreaths just keep getting cuter and cuter. i really really like the addition of the butterflies and dragonflies...and the fact that you customized them to fit in with the wreath! This is stunning! 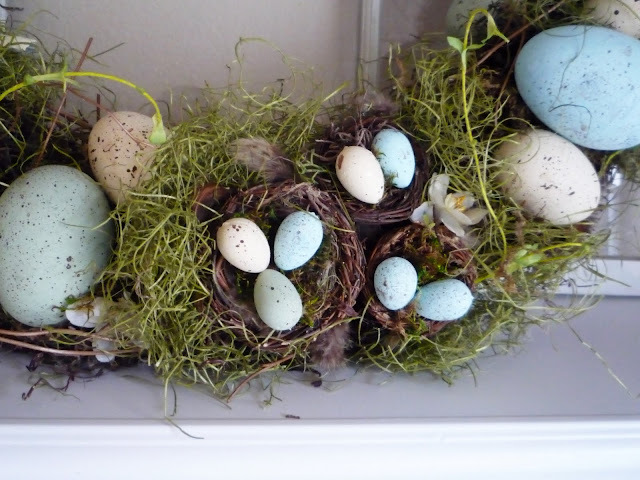 Love the moss and the finish you did on the eggs - very inspiring...and gorgeous! 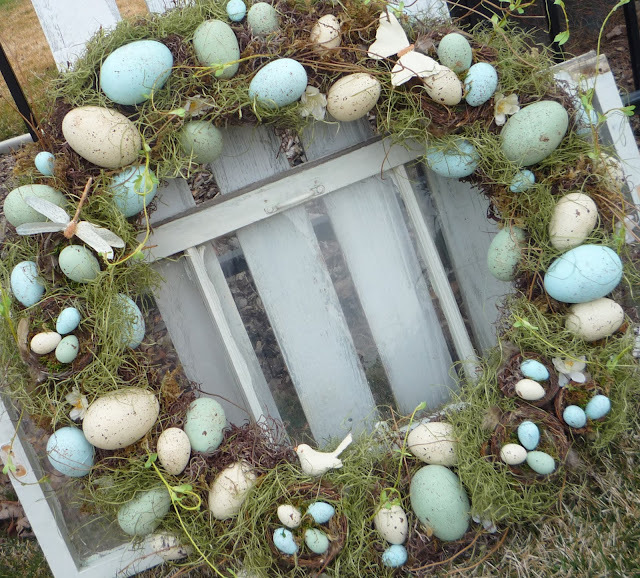 I love all your egg wreaths! It's very cool that you take an item that has the shape you want and paint it to match your wreath theme. I guess I just never think of doing that but you've inspired me! Thanks! We also have a linky party at www.luckystarlane.com on Tuesday! 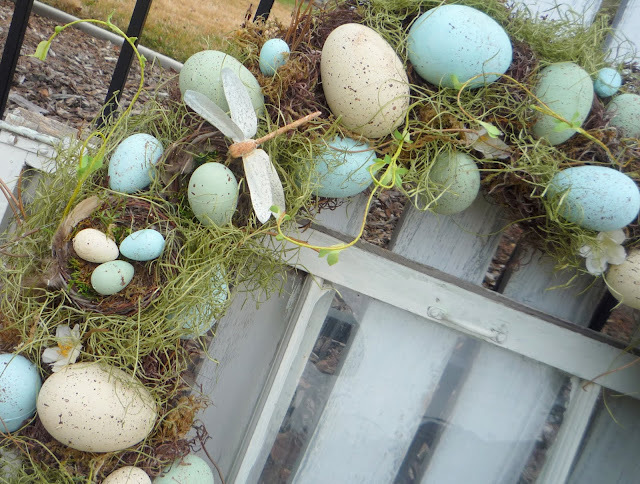 i just had to mention your beautiful egg wreaths in my blog. i tried to make one...tried being key word. i didn't have the mini eggs. may have to go to the store to get some to add. i also mentioned the gun cabinet. still can't get over that one either. Okay your wreaths rock! I just love them all - this one looks truly fantastic. I have been meaning to make myself a wreath like that. Yours is so cute! This is a very beautiful wreath, you did a fantastic job. It will def be on my have to make list lol. Love your blog! 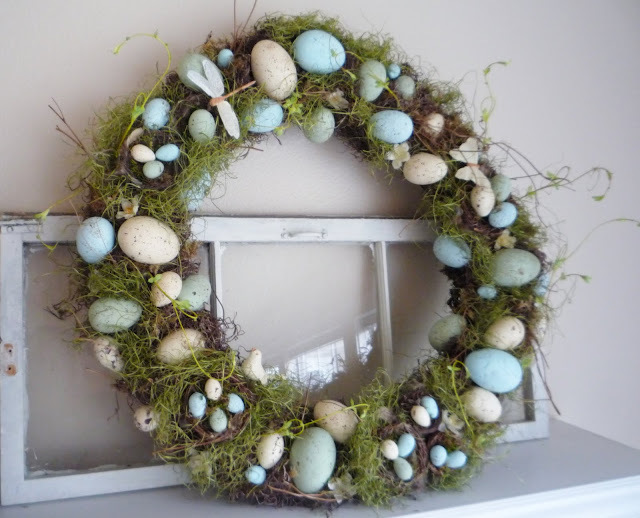 That is the cutest Easter wreath I have seen in a long time! I love it!!! These are absolutely fabulous wreaths! Love them and your crafty ideas! Wow! This is great! If I start one more spray painting project, my husband is going to kill me! 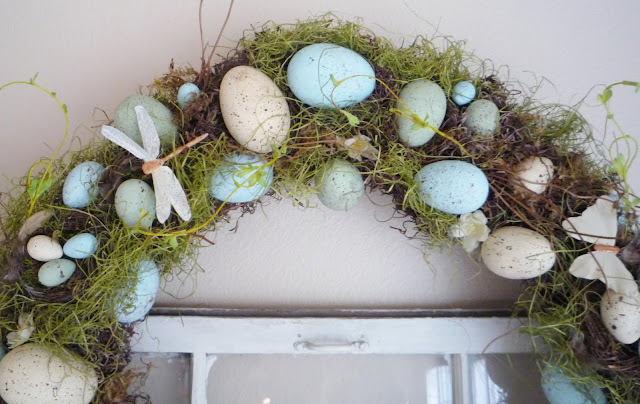 I definately believe this is my most FAVORTIE egg wreath I've ever seen! It's gorgeosu! So, you spray painted them first, and then painted them with craft paint? Also, how did you "speckle" them? Thanks! !